Discs are used under polishing or buffing machines. They are made from the same high quality Monster paper as the belts and rolls with an excellent surface quality that resists heat loading and dust build up. Virginia Abrasives have again re-engineered this basic product for ease of operation. Virginia have developed the Quicksand disc which has a special gripping grit on the top side to bind with the nylon pad turning the polisher into a sander with out the need to use a sandpaper driving plate, thus saving both time and money. 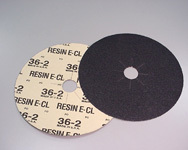 Sanding discs are available as a single sided or double sided disc, 405 mm dia. 60p, 80p and 100p grits.